Updated circuits: Improved AC Zero Crossing Detectors for Arduino. 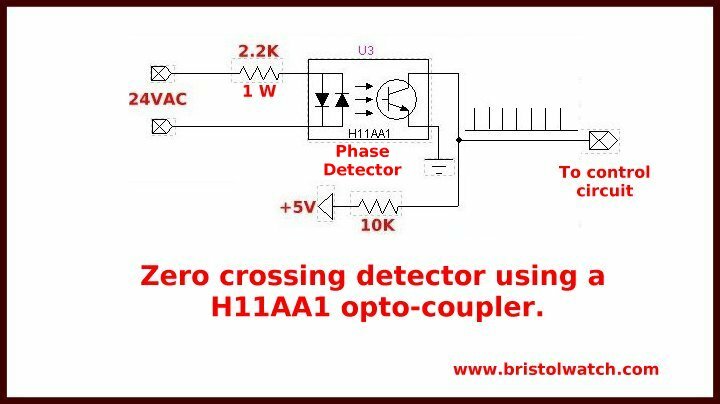 A zero-crossing detector is used to generate a sync pulse related to the AC voltage phase angle often used in power control circuits. Fig. 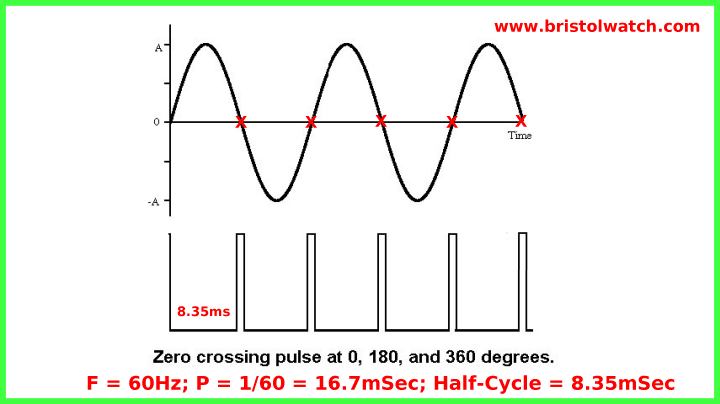 1 shows the relationship of a zero-crossing pulse to a sine wave. The pulse occurs at 0, 180, and 360 degrees. Fig. 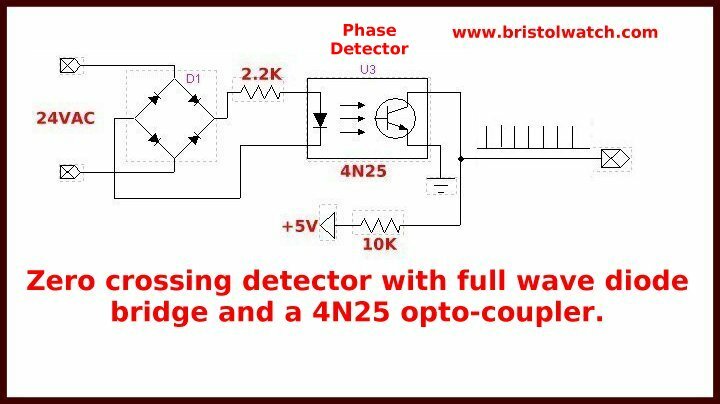 2 shows how to use a H11AA1 opto-coupler to generate a TTL level pulse. During most of the time the photo transistor output is LOW except when the voltage is near zero when the collector goes HIGH. The dual LED emitters of the H11AA1 assures both half-cycles are utilized. Fig shows a more common opto-coupler such as a 4N25, but to use both half-cycles will require a diode bridge input. Fig. 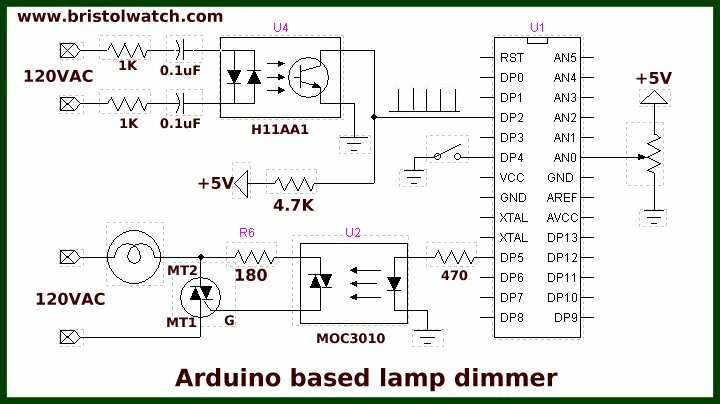 4 shows a direct application of a zero-crossing detector using an Arduino micro-controller to control the power output to a lamp. This variation still uses the H11AA1 but can be directly connected to 120VAC. The sketch is shown below. The output of the H11AA1 is connected to Arduino DP2 to use its internal interrupt INTR0. When the switch on DP4 is closed a LOW is detected and the program connects interrupt 0 turning on a interrupt service routine acon. The ISR reads the value of the potentiometer on AN0, divides by 4, then calculates a delay based on that value. The longer the delay (between 200uSec. and 8.3mSec.) the less power delivered to the load. The circuit will act as a lamp dimmer. which after delay switches on  a triac. // delay() will not work!